As your silent salesperson, Sarah grabs customers' attention to your products. Abstract style for cutting-edge, trendier looks. With easily detached arms, hands, and legs, easily dress him in a variety of clothes. The included glass stand stabilizes him for display. No tools required. Sarah stands with her left leg slightly forward. Both hands are at or below the waist. White glossy head does NOT have ear holes. Go from classic and conservative to bold and wild - you choose. Clothing and accessories sold separately. Mannequins warrantied as new unless specifically stated. If you are looking for used or damaged mannequins email sales@amt-mannequins.com for details. Mannequins designed for inside use only. Although customers have used them for outdoor displays, such usage is not warrantied. Mannequins are designed to support normal, everyday clothing only. Please contact us if your planned usage includes specialty clothing such as military uniforms, armor, theatrical outfits, or special character costumes. Mannequins are made by hand so there will be slight variations in the features from the product photos. Variances in mannequin production runs are normal – if a particular look is critical, we suggest purchasing a second mannequin for parts. Contact us for bulk purchases. Mannequin skin and hair color may vary due to lighting and your computer monitor. Photos contain watermarks which may alter skin tone slightly. With metric to inches conversion, mannequin dimensions rounded to nearest 1/4 inch. Most people don't realize how large adult mannequins are so check the mannequin dimensions before ordering. 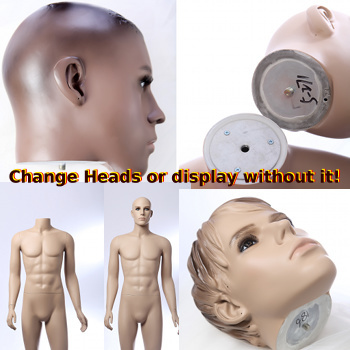 See "Shipping / Returns" page for additional information about our mannequins. Click the button below to add the Mannequin Female Standing Model Sarah (Plastic) (Egghead) to your wish list.